The fundamentals of standardazation of modern Lithuanian grammar - автореферат и диссертация по филологии. Скачать бесплатно полный текст автореферата диссертации на тему Балтийские языки. Полный текст автореферата диссертации по теме "The fundamentals of standardazation of modern Lithuanian grammar"
culture -n the Institute ot the Lithuanian language of the Lithuanian Academy of Sciences. The thesis will be maintained on the u th of iiuUlto 1992 at 17 o'clock at the meeting of the Specialized Council D 061.01.0t (of nalntaince for a degree of candidate of philology) at the Vilnius University. Place of malntaincei Faculty of Philology, University-street 3, 2734 Vilnius, Xithuanla. You can find the thesis at the Scientific library of Vilnius University. 1. The urgency of the theme. If *e accept the statement that any standard language (SI) is affected not only by spontaneous factors, but also by the conscious activity of a sooioty, of its specially-prepared members, naturally, the following question arises! by what principios are the functioning and the development of the SI regulated? First of all. to solve this problem - the main problem of theoretical and practical standardization work - it is necessary to examine, what has been done in the field of speech culture to the present. Sone scientific rorírs of this trend have appeared already. The theoretical fundamentals and the practical activity of such lithuanian linguists as Jonas Jab-lonskis, Juozas BaiSikonis. Franaa Slrard2ius and some others are being studied by J.Palionio, A-PiroSJcinas, A.Pupkla and other scholars. But it can be said that any generalizing works - to show the standardization of 3L a3 an unbroken process - are not yet written. 2. Through many years, during the post-Jablonski.s period up to our days, many recommendations on the use of various grammatical phenomena (GP) have been published in many publications devoted to language practise. So ;just these grammatical recoaaieDdations are taken as a basis to investigate tb.e fundamentals of standardization of modern Lithuanian grammar. In this my the object of this worlc is not a grammatical systeii itself, but a o t i v e b of grammatical recoamendati.ons. So the aim of the thesis is to examina the main motives, arguments, on which the recommendations are based, and to try to disclose the mstho&s of estimation of GP. More concretely the tasks of the work can be defined asi 1) to oompare the differences between motivation of morphological and syntactical phenomena estimation! 2) to examine chat kind of motives are considered the main and. auxiliary; to find out their connections and to disclose what principles and criteria wera used in standardization of gramaari 3) to exaaine the ratio of basing on the people's language and the CL usage in grammatical recommendations! <•) to appraise the motivation of recommendations in different publications and of different authors and to show the changes in the estimation degree of GP during 60 years of functioning of the modern system of Lithuanian grammar. 3. The material for the work is collected from five source-books - the main practical editions of speech culture in the period 1930 - 1990. They ara the following! 1) J.Baliiko-nis "Selected works" (froa 1930)! 2) the periodical "Eative Language" (Kaunas. 1933-19+1); 3) the periodical "Native Language" (Chioago, 1958-1968)¡ 4) the periodical "Our Language" (1S68-1S09)i 5) the periodical "Speech Culture" (1S61 - up to 1S90). These source-books don't reflect, of course, the whole proceaBS of granmar standardization, but for the aim of the tori: to show the motives of this standardization they aro adequate. The basis of the research are 1 663 grammatical reco-Emendations (B.? - 63, fil^ - 181, NL2 - 169, OL - 795 , SC -<.">5). many new notions of speech culture are used and explained in the work (recommendations and their structural parts! the estimation motives) the estimation degrees! functional and for-raal variants! analogies and their kinds, etc.). Thirdly, some sourses of the work (eseentialy NL2 and, partly, HL^) have not featured in Lithuanian 6cholary works on speech culture or were used very little. The present work makes open use of those periodicals for the first time. 5. As there are no schlary worka in Lithuanian linguistics of this kind, thr author of the thesis has had to look for Bome new methods to analyse grammatical recommendations. The main method can be defined so analytical, with some elements of distributional analysis (especially in Part II). Besides that, the statistical method is applied to compare various motives of grammatical recommendations (Part III), The methods of the work are defined mors exhaustively at the beginning of Part II and Part III. 1)	The real norm of SL is different from the* norm of people's language not only in quantity, but also in quality. Though it is more acceptable for theory and practice of culture of speech not to identify the SL norm with SL usage. 2)GP	in recommendations are estimated according 'co the following fundamentals: a) by the f;ield and character of usagai b) by the correspondence of grammar system and ruleas o) by the correspondence of the needs of SL users. 3)	The results of grammar standardization are highly dependent on which principle the standardizators prefer: the' supporting of language traditions (i.e. the codification, the stability of noma3) or the heeding of changes of usage (i.e. the tendances of language development end the seeds of SL users) . ■ 4) It is not possible to establish a universal scheme of principles and criteria for all GP. Ib can only be said that correctness (systematic nature) and purity are taken into account most of all. These criteria la every concrete case can be co-ordinated with various manifestations of the principle of expediency. 7. Theoretical value■ The author of the thesis tries to reconcile йоге or less the theoretical and practical discrepancy of understanding of SL nora and to show practically the exaistence of a triad: codification - real SL norm - SL usage. Further, the theoretical postulates of some Lithuanian linguists are extended in the work and some of them (for example, of L.Danbriunas) ere adduced and compared with others for the first time. Thus the work provides the basis for continuing studies of the history and theory of standardization work in Lithuania. Practical worth, ihe classification of grammatical variants (GV) adduced here in this work can be used in perfecting all the classification of speech mistakes and variants. The establishment of a sysfcets of estimation degree (ED) of GV can be applied in new recommendations, not only in the field of grammar. It makes it possible to make these recoaimendatlcns mere definite and clearer to the users of SL. Generally, the conclusions of the work can be used to turn the standardization of SL into more direct way. Language Institute of the Lithuanian Academy of Sciences (in 1990, 1991 and 1992) aa well as at the meeting at the Lithuanian language Department; of Vilnius University Philological Faculty (in 1992). The main principles and disputable problems have been presented in five articles. 9. The thesis consists of a preface, four main parts, a conclusion and a list of cited literature. The first part is a theoretical introduction, the second and the third parts (consisting of some chapters) are analytical and the fourth part is the synthesis of Part II and Part III. The text also contains tables and schemes. The preface defines the relevance of the chosen topic and its purposes, explains the novelty of the work, defines methods Used in it, discusses the theoretical and practical value of the thesis, defines the principles which are given for defending and comments on the structure of the work. grammatical recommendations which are the object of this work. But standardization of • GP is baaed on descriptive grammar, too. So we must establish, what peculiarities of grammar are the most important for its standardization. - functioning and development - are discussed. It is argued that grammar (especially morphology) is one of the moat stable parts of the language system, and that influences the principles of standardization of GP. Some other issues connected with the standardization of grammar (i.e. grammatical variability, distributional relationship of grammar variants, etc,) arc also discussed in this part. The second important problem touched upon in this part is the problem of language norm. This notion is treated in foreign and our linguistics In very contradictory way3. But without general conception of norm purposeful standardization work is impossible. Essentially there ia a noticeable contradiction between theoretical and practical point of vie» towards norm3 in Lithuanian linguistics. First of all we must distinguish two notions - language norm in general and BL norm. Some Lithuanian linguists (A.Gir-denie, A.Pupkis) define the 3L nora (according to the general norm) as a real usage. But in practice SL norm is often defined as codification (i.e. some collection of language rules). Beally the SL norm should not be identified neither with the codification, nor with the SL usage. Heal SL norm exaists in the strain field between codification and BL usage. Their relationship are discussed in the first part of the work in mors detail. One chapter of the first part is devoted to introducing the source-books of the work. Some facte of their publishing history are given iu that chapter. logy of examination of grammatical recommendations. If m> «rant to compare various recommendations of different authors and editions, ire must look for Borne common parameters. At first glance, grammatical recommendations are very different In many aspects, bub after examining their structure we can say that they have some characteristic parts*, naming, defining, motivating and estimating. Sometimes they can be recognized only after consistent analysis. The last two parte - motivating and estimating - are the most important for the work. The estimation of GP is grounded in the motivating part. All the verbal expression of that part is named motives in this work and it Is the main object of studies. From the estimating ptirt of recommendations «'« can more or less decide something about the estimation degree of GP. The detaled examination of motives and estimation degree glvys a ground to reach noma conoiusions about the principle«, criteria and methods of standardization of grammar. The gaoond part of the work (named "The review of standardization of grammatical phenomena") aims to examine grammatical recommendations in four aspects: a) what kind of grammar variants are given in the recommendations b) what is the estimation degree of grammar variants and how does it develop in various recommendationsi c) in what way is the estimation of GV and its changes motivated! a) how are the motives connected with the grammatical peculiarities of variants. the sentence. The second part - the combinations and the cons-tractions of the words - is ths biggest. GP of that kind are classified not as usual in the urorks of speech culture, but going from the meaning to their form. In such a way wa can see the peculiarities of grammar variants better than going from their form to their meaning. She last chapter of the second part is named "Susisarlziag notes". The review of GV enables to reach the conclusion that there are two kinds of GV functionating in SL usage - formal and functional variants. Formal va-ianta (a 5 b )-*- from the standpoint of real norm can make the relationship of free distribution (i.e. they can duplicate functions of eaoh other without any difference of meaning). In such cases codification of three kinds is possible: a) all the variants are codifii—ied as the SL norm and treated as doublets or grammatical synonyms (dij^ti^sulig pla-nu s pagal planq "to work according to the plan*» lab^ dlen^ : laba^diena "good afternoon"); b) one of the variants Is codl-ficated negatively as a violation of SL norm and Is eliminated (0 p a 1 1 n mAnuo "October")» c) If any difference is discovered, however (archaism, dlalectallem), those variants are as usual differentiated stylistically (short and long forms of the tsrorda, dual and plural forms, supine and infinitive, etc.). ^ Here a, la sign the form of variants; x^signs their meaning or function. needless (analytical forms of degrees, some kinds of sentence combination). Functional variants (ax : by) from the standpoint of real norm can make some kinds of distributional relationship. If they make the relationship of contrastive distribution (i.e. if from the standpoint of real norm in the same context variants have different meanings) and in usage they functionate by the principle of free distribution, the codification is strict in most cases. In difference from formal var'.ants, the motives of lucidity and logi^ are given more often in estimati ¡ of functional variants. of nominative ¡ vocative¡ fact-mood s obligue mood; main nu-aerals i numerals used with pluralia tantum, etc.). a " b . Variant a is estimated, by this degree as a clear aistake. not used in SL. Almost all the authors of recommendations agree on the estimation o^.' such variants (padidintas = padidd^s kraujospcdis "increased blood pressure"; dukartji = per dien^ "twios a day"; direktorius = d^^ctors iilieofi "director ¡SilienA", etc.). ^hc actives are similar in all reccm-ne-ndations of this kind: correctness, purity and the tradition of correcting. As the supplementary motives can be used lucidity and other requirements of good style. a - b. eost freguent verbal expression of this ED is "better not to use". ™e can find two reasons for applying this dagree in estimation of grammatical variants, First of all by estimation a - b the authors of recommendations try to find a compromise if there is no agreement for the worth of GP at all and if opinions are different (singular ! plural forms of the names of some holidays! gerund : construction with 461 ("for") expressing cause, etc.). The second reason for applying a - b ED can be defined aa taking into account the tsndonees of language development and needs of language users, which are not more corresponding to the strict estimation a « b. In such a way eventually the estimation of forms labfj dienq ("good afternoon") (in HL^)» viffi ("above") with genitive case to designate tha exceeding of quantity (in SO) and others were softend (a = b a - b). and In some сааез aa a phenomenon being behind the limit of norm, but permissible. Many authors estimate archaisms, dla-lectalisms by this degree. Noticeable efforts are being made to define in some way the sphere of using of such grammatical variants, i.e. to differentiate then stylistically. As these variants are more or leas of equal worth (both correct, pure), the motives of their estimation are different from variants with « =■ b or a - b ЕЯ. It becomes important to establish which variant can carry out one or another function better than the other: which of them is йоге exact, economical, convenient and 30 oa. a / b. Both the variants are treated as SI погиз and can be used freely if they don't have any differences of meaning (in this case they are treated as synonyms) : ba_igA / u2-baLgi ("has finished"); iiari tipper / P^^Jlaagq ("to loo's. through tha window"); vaikssioti plevoja / po plevq ("to sralk in the meadow")» etc. Having in talnd the system of four SD, we can concretize the statenent about tha relationship of codification, real norm and usage. Variants, estimated by a / b, make up the kernel of real norm and are codified positively. From the pair of variants, estinated by a = b, the a io codified negatively and la treated as a contrast to the kernel of real norm. The intermediate dagre3s a - b and a // b show evidently escalating the layer from real norm to mistake. In that layer the partial, peripheral norms are functioning as well as показ being earlier codified and potential (future) nprns. constant and various authors treat the variants not always In the same way. This is esoeoially true of newly-appeared and disappearing grammatical variants. In general, the authors of recommendations endeavour with the help of codification to stabilize the real norm, to define its limits, but abnormal variants, functioning In SL usage, split and weaken the real norm and push out of the SI, usage even positively codlf'sd variants, which belong to the kernel of SL norm. These processes in 6ramaar field are going comparatively slowly, but the re/lew of 60 years of grammatical recommendations show them being evident. The third part of the work consists of sir chapters. The object of this part is the same as in ths second part - the recommendations and their motives. But the aspect of studies ia another. The main motives are examined according to five source-books of grammatical recommendations. The motives, which are compared in this part of the work, are the following! 1) the sphere of using GV (people's language, early Lithuanian texts, fiction)! 2) purity of GV; 3) the standardizing tradition of Jonas Jablonskis and his authority; *) functional-sty-listical differentiation of GV. It also aims to show the differant modeB of motivating, by comparing the application of analogies of various authors and editions. konis grammatical recommendations makes up a harmonious system and shows th8 consistency of hia views. The main motive of J.BalSikonis recommendations la the people's language, and the rest motives are more or less connected with it. The analysis of grammatical recommendations published in "Native Language" (1933-19*1) - 111^ - showes, that the main contributors (P.Skardilus, P.Jonikas, A.Salys, J.Talmantas) observed In many cases their views in language practise which they declared in theory. They began to discuss a new problem in Lithuanian linguistics - the expediency of UBing language phenomena and tried to take it into account estimating GP. On the basis of their grammatical recommendations we can better understand one of their most important statements about modern SL usage as a criterion of SL. Wa can say that SL usage was prefered only in the sense that the ITL^ contributors tried to decide what SL - as an independent language system - needs and what la unnecessary tor it. But SL usage was not the most important source» of norms in their grammatical recommendations. They operated with the facts of people's language and early texts very often too. to extremes. Though he showed hie subtle sense of language in some questions of syntax, generally he looked at the processes of language development from the point of view of logic. Many mistakes of speech which were traditionally corrected by other linguists (from J.Jablonskls), were recogniEed as standard facts by L.Dambriflnas (for example, some cases of using of locative). So be tried to reviee the traditional Lithuanian grammar system and offended the demand to keep the stability of SL norma. The views of L.i)ambrianas to the SL usage, his interpretation of correctness crytorion, the application of various analogies are discussod in the thesis in more detail. The recoamendatione of periodicals "Our Language" ("Musii kalba") and "Speech Culture" ("Kalbos kultrura") are discussed in the.same chapter of the third part of the thesie. These two periodicals were published almost at the same time (the second - "Speech Culture" - is still being published), so the authors are the same in most cases. But there are some differences in adducing recommendations, in themes, зо it enables to compare these two periodicals. The views of contributors of'OL and SC to the people's language, the SL usage, functional-stylistic differentiation of grammatical variants are discussed In this Chapter too. The last chapter of the third pact of the thesis generalizes the facts examined from the recommendations of five source-books. The conclusion follows, that we can distinguish two types of motives of grammatical recommendations: 1) motives, oriented to the language itself! 2) motives, oriented to the users of language. Here you can look at the table to вез the motives of recommendations in some detail (pg. 15). ■2. Other motives (conveniency to uaa	etc.). A quantitative analysis haa been done (applying statistical methods) to identify the differences between aotives of five source-booko. 3oa)a Interesting fact3 of motivating GP usage became clear. The main motive of the first group, where the sphere and tha node of usage is defined, ia tha people's language, but ito importance over the course of sixty years (from BaiaiUonis to our days) iB decreasing. Examples la early tests ae a motive la applied not very often (if only In and IJL„, especially by A.Salys and P.Skardiitts). but the usage of literary language, on the other hand, Is becoming more important. An Interesting conclusion must be donei though the mentioned spheres of usage usually are treated as the sources of SI norns, but sometimes the ptafrqs of the criterion of norma can be given to some of tb m. For example, the people's language was a guaranty of correctness to J.BalSlkoniB in most cases, and L.Dambrianas treated modern SL usage as a criterion of SL norms. The opinion of J.Jablonskls is mentioned in ILg moat of all, but only about half of the recommendations of that periodical (essentialy of L.Dambriunas) support J.Jablonskis authority. J.Balsikonis and NL^ agree with the tradition of J.Jablonskis standardization almost in all cases and the periodicals OL and SO in about 70 per cent of cases. The motive of purity is applied to estimate the GP almost equally during the 60-year period (this motive Is connected with the motive of correctness very much, if we have in mind GP). But functions]-stylistic differentiation as a motive rose in importance especially in OL and SO. The examination of the motives shows significant shiftB in time in the importance of motives: It increases going from the top to the bottom (see table, pg. 15): irom the sphere and mode of usage to the correspondence of grammar system and rules and to the needs of SL users. of recommendation8 enables one to reach several conclusions about the principles and criteria applied, in grammatical recommendations. The main criteria are the correctness (systematic consistency) and purity, while the rest have only an auxiliary function in the estimation of GP. Some of them are discussed in this part of the work (the sense of language, the etiquette of language, lucidity, concision of language, etc.). Their application is regulated by the principle of expediency, which cfin be understood ae functional, functional-stylistic and eommuni-cational expediency. 1. If we do not identify the SL aora with SL usage and consider the existence of the triad: codification - SL real norm - SL usage, we should be able to maintain that the SL norm and the norm of people's language differ not only in quantity, but also in quality. To make the difference between the SL norm and SL usage is necessary for theory of speech culture ao well as for its practice. 2. We can reach conclusions about the peculiarities of grammatical variants from the recommendations only indirectly. But it la clear that functional variants are the most dangerous to the atability of SL grammatical system. Ae the authors of recommendations notice themselves, it Is connected essentially with the influence of foreign languages. tlona to estimate GP. In practice the criteria of correctness and parity are applied uost of all and sometimes they are combined with the concrete manifestations of the principle of expediency. Wa can't find any universal system to estimate all grammatical variants. There are several reasons for this: a) the leyicalisation of some grammatical phenomena; b) the tradition of using not sys-enatical phenomena; c) the concrete situation of usage, which can correct the rules of codification (the "impact" of the text, the context of the sentence, the needs of Si users, etc.). 5. In general it can be aald that the results of standardization of grammar depends oa how two tendencies of language (stability and developement) are treated by different authors. But more extensive studies are necessary to compare the standardization of grammar with the levels of vocabulary, word-formation and other parts of language system. Articles written on the analysed thome are the following? 1. The motivation of using standard language in the periodical "Speech Culture" ("Kalboa kultara") // Mast* kalba (Our Language). 198S. N. 2. P. 7-1* /In Lithuanian. 2. The criteria of language standardization and their application // Must* kalba (Our Language). 1987. N. 2. P. 2732 / In Lithuanian. .
4. Analogy sa the method of linking and estimating of syntactic phenomena // Kalboa kultcsra (Speech Culture) (to be published) . 5. 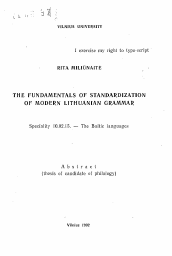 Standardization of grammar In the periodical "Uativa Language" ("Glmtoji kalba") (1958-1S6B) // Lietuviit kalboty-ros lclausimal (Problems of Lithuanian linguistics) (to be published) . Грамматикализация конструкций с глаголом "делать"